Major search engines like Google are constantly tweaking their search algorithms to produce higher quality, more relevant search results for us when we perform a search for a particular keyword or keyword phrase. One of Google’s search innovations was creating instant search and other personalized search capabilities which examine your search habits and then use this information to modify the search results you see whenever you perform a search. This is refereed to as personalized search. For example, if you frequent a certain site and then do a search for a term related to that particular website, all things being equal, that site will appear higher in your search results than a site you haven’t yet visited. If you regularly visit CNN.com and then do a news related search, CNN.com web pages will usually be returned in your search results over other news related websites. If you had never visited any news websites in the past or you turn off personalized search features, Google would then return the best web pages matching your search keywords regardless of your previous search habits. Viewing natural search results without the bias of your own personal search habits is crucially important when determining how high your website ranks for a particular keyword or keyword phrase. Performing a keyword search for a keyword related to your website will commonly bring up your website much higher in the search results than an ordinary web searcher or a new potential client searching for the products or services you offer that has never before visited your website. This after all, is the type of individual and web traffic you’re trying to direct to your site and capture. By default, Google will personalize your search results, even if you’re not logged into your Google account. You’ll need to “unpersonalize” your search results to get an accurate picture of how your website is really ranking for the rest of the world. To do effective SEO, this is an absolute. So how do you turn it off? There are a number of methods to do so, but one of the easiest is using the “&pws=0” parameter. First, you’ll need to turn off instant search results in Google. To do this, perform any Google search through your Google search bar in your browser or by navigating to Google.com. 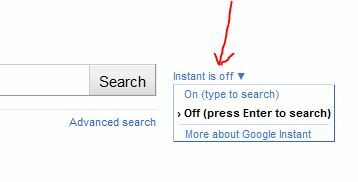 Next click on the “Instant in on” link next to the main Google search bar button. When doing a Google search for a certain keyword or keyword phrase, you’ll see a search URL appear in your web browser’s address bar. By clicking on the two links above, you should get two different results. The first taking into account your search history, habits, present geographical location, and other personalized factors. The second link, with the &pws=0 parameter added to the end of the search URL, will provide you more natural mostly unpersonalized results. Geography can still play a role in search results bias even using the &pws=0 parameter, but all other primary factors will be disabled. It’s also important to note that sometimes your personalized search results will closely match natural, unpersonalized search results, however this usually isn’t the case if you’ve already visited other websites related to your keyword search. Unfortunately, the &pws=0 parameter will not permanently stay appended to all your future search queries, so you’ll need to add it again to the end of each new query you perform. There is a way to use the Grease Monkey Firefox plugin to set your browser to always add the &pws=0 parameter to the end of your search queries and this a more advance topic you can learn about by vising the Grease Monkey website or doing a search for “Greasemonkey &pws=0“. Disabling Google personalized search results is a critical component to performing accurate SEO for your website. Appending the &pws=0 parameter to the end of your search URLs will give you a quick and easy way to depersonalize your search results providing you the ability to view the natural, unbiased search results for the keywords for which you’re trying to rank highly.